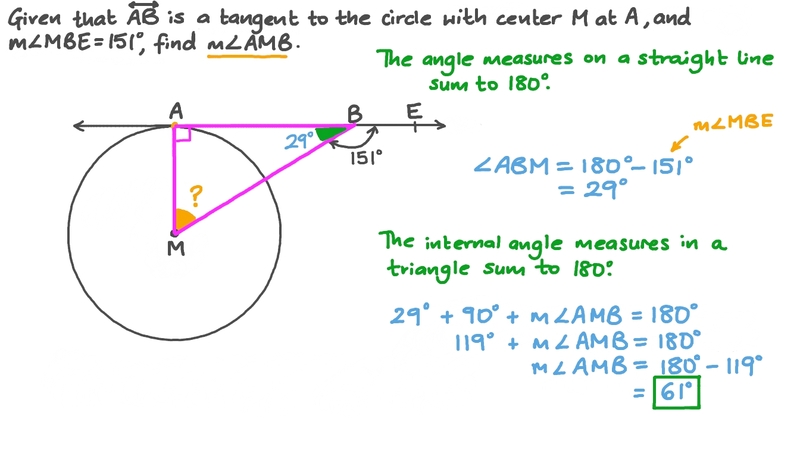 In this lesson, we will learn how to use the properties of tangents of circles to find missing values. Given that ⃖     ⃗ 𝐴 𝐵 is a tangent to the circle 𝑀 at 𝐴 , and 𝑚 ∠ 𝑀 𝐵 𝐸 = 1 5 1 ∘ , find 𝑚 ∠ 𝐴 𝑀 𝐵 . What is the name of a line that meets a circle in exactly one point? Circle 𝑀 has radius 11 cm. If 𝐶 𝐴 = 1 6 . 3 c m , what is 𝐴 𝐵 ? Answer to the nearest tenth. Given that 𝐴 𝐶 = ( 2 𝑥 − 3 ) c m , find 𝑥 and 𝑦 to the nearest thousandth. Given that is a tangent to the circle , and , determine . Given that 𝐴 𝐵 is tangent to the circle 𝑀 at 𝐴 , 𝐴 𝑀 = 8 . 6 c m , and 𝑀 𝐵 = 1 2 . 3 c m , find the length of 𝐴 𝐵 , and round the result to the nearest tenth. In the figure below, 𝑀 circle, 𝑀 𝐵 = 1 0 2 c m , 𝐴 𝐵 = 1 3 6 c m , 𝑀 𝐶 = 4 8 c m , and ⃖     ⃗ 𝐴 𝐵 is a tangent, find the perimeter of the figure 𝐴 𝐵 𝐶 𝑀 . Given that  𝐵 𝐶 is a tangent to the circle and 𝑚 ∠ 𝐴 𝑀 𝐵 = 1 2 0 ∘ , find 𝑚 ∠ 𝐴 𝐵 𝐶 . Given that ⃖     ⃗ 𝐴 𝐵 is a tangent to the circle 𝑀 , and 𝑚 ∠ 𝐴 𝐵 𝑀 = 4 9 ∘ , determine 𝑚 ∠ 𝐴 𝐷 𝐵 . Given that 𝐴 𝐵 is a tangent to the circle 𝑀 at 𝐴 , 𝑚 ∠ 𝑀 = 1 3 0 . 2 ∘ , and 𝐸 is the midpoint of 𝐶 𝐷 , find 𝑚 ∠ 𝐵 . Given that 𝐴 𝐵 = 8 . 2 c m , find the length of 𝐵 𝐶 rounding the result to the nearest hundredth. Given that ⃖     ⃗ 𝐴 𝐵 is a tangent to the circle 𝑀 at 𝐷 , 𝐴 𝐶 = 𝐵 𝐶 , 𝑚 ∠ 𝐴 = 6 0 ∘ , and 𝐴 𝐷 = 3 4 . 7 c m , determine the perimeter of △ 𝐴 𝐵 𝐶 . Given that ⃖     ⃗ 𝐴 𝐵 is a tangent to the circle 𝑀 , Find the perimeter of △ 𝐴 𝐵 𝐶 . Suppose that, in the figure,  𝐴 𝐵 is tangent to the circle at 𝐵 , 𝑀 𝐵 = 3 2 c m , and 𝐴 𝐶 = 5 1 . 2 c m . What is the length of 𝐴 𝐵 ? If two circle intersect at two points, how many common tangents do they have? 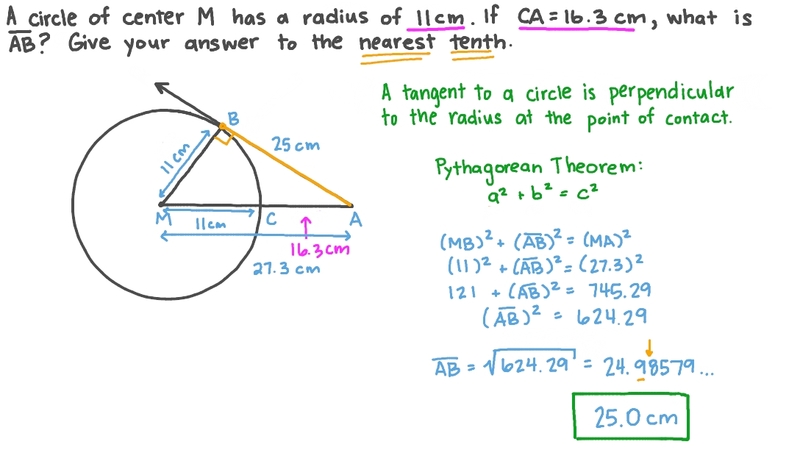 If I draw two tangent segments from a point outside the circle, are they equal in length? If two circles lie outside each other, how many common tangents do they have? If I draw two tangents to a circle, one from each end of a diameter, are the tangents parallel? Given that 𝐴 𝐵 and 𝐴 𝐶 are two tangent segments to a circle at the points 𝐵 and 𝐶 , and 𝐴 𝐵 = 9 1 c m , determine the length of 𝐴 𝐶 . In the figure, line 𝑋 𝑌 is tangent to the circle at 𝑋 . What is the length 𝑍 𝑌 ? Given that ⃖     ⃗ 𝐴 𝐵 is a tangent to the circle 𝑀 , find the length of 𝐷 𝐵 . In the figure, ⃖      ⃗ 𝑋 𝑌 is tangent to circle 𝑀 at 𝑋 , 𝑀 𝑌 meets the circle at 𝑍 , 𝑋 𝑌 = 2 1 c m , and 𝑌 𝑍 = 1 1 c m . Find the circle’s diameter to the nearest tenth. Line ⃖     ⃗ 𝐴 𝐶 is tangent to circle 𝑀 at 𝐴 . Given that 𝐵 𝑀 = 5 5 c m , 𝐴 𝐶 = 9 6 c m , what is 𝐵 𝐶 ? The two circles 𝑀 and 𝑁 are touching externally. ⃖     ⃗ 𝐹 𝐴 is a common tangent to them at 𝐴 and 𝐵 respectively, ⃖     ⃗ 𝐹 𝐶 is a common tangent to them at 𝐶 and 𝐷 respectively. Given that 𝐴 𝐵 = 1 1 . 0 1 c m , and 𝐶 𝐷 = ( 𝑦 − 1 1 . 0 1 ) c m , find 𝑥 and 𝑦 .